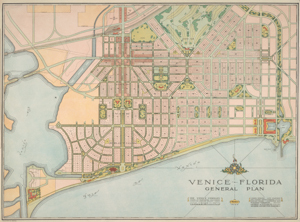 Venice, Florida: General Plan, 1926. John Nolen Papers. The John Nolen Research Fund, established through the generosity of the Nolen family, provides assistance to scholars to conduct research in the John Nolen Papers (#2903) and allied collections in the Division of Rare and Manuscript Collections (RMC) of the Cornell University Library. Any qualified researcher interested in the history of city and regional planning before 1950 with a project that can be augmented by using the Nolen Papers is eligible to apply. Awards: One or more awards of up to $2000 may be made annually. Awards are intended to provide only partial support for any project. Applications are reviewed and awards made by the Nolen Research Fund Committee. Requirements: No Cornell affiliation is necessary, and the award carries no formal Cornell affiliation. Researchers may apply more than once. At the conclusion of the year's support, each scholar is expected to submit a copy of any publications acknowledging support from the Fund. Deadlines: Applications are due annually by April 30; awards will be made by May 31 for support to begin on July 1. Research must be completed within one year. Cover page indicating name, rank/title, mailing address, email address, phone number, the title of the project, abstract, and the total amount of funding requested (1 page). Research proposal, including the research topic and an explanation of how onsite use of the Rare and Manuscript Collections is essential to the successful completion of the project. Comment on the significance of the work and its potential contribution to the history of city and regional planning. Specify which collections will be used, the projected timeline, including approximate dates of travel, and plans for publishing or otherwise disseminating the results of your project (2-3 pages). Budget showing the expenses for which support is requested. Eligible expenses include travel, lodging, and scanning or other reproductions. Please read the budget and tax information for grant applicants (1 page). Graduate students should also submit a letter of recommendation from a faculty advisor or thesis director on the significance of the topic and the abilities of the candidate. Other applicants may submit one or two letters of reference, but are not required to do so. Application submission: Please submit your application as a single PDF via email to Connie Finnerty, Administrative Manager. Questions: For further information about this research grant, please contact Elizabeth D. Muller, Curator of Media & Digital Collections.